As many of you know, last week, May 13th thru the 19th, was National Food Allergy Awareness Week. For the second year in a row, I was proud to organize yet another Allergy~Friendly Baking Event at St. Marks School. This year it wasn't a fundraiser, rather a 'Baking Extravaganza'. In our efforts to promote promote allergy awareness, all of the kids working the tables had food allergies or were siblings of those with food allergies. This was an opportunity for the 'Kids With Food Allergies', those who normally don't participate in other yearly bake sales or food events, an opportunity to share that foods with alternative ingredients taste just as good, if NOT better, than the baked goods their friends are accustomed to enjoying. ALL of the baked goods were completely NUT/TREE NUT FREE! We even had items DAIRY, EGG, GLUTEN and SOY-FREE. Chocolate items were a huge hit! The chocolate covered rice krispie treats, brownies and the chocolate/sprinkled pretzels went the fastest! We also had chocolate and vanilla cupcakes, oatmeal and oatmeal chocolate-chip cookies and gluten-free lemon poppyseed muffins! I have to be honest and share that there was one glitch. The kids working the tables knew they weren't supposed to eat anything without asking, as not all items were just nut/tree-nut free. Well, the temptation was a bit much for one child who normally wouldn't eat anything without asking first. A trip to the school nurse and a little benadryl later, all was good. I felt terrible that this happened on my watch. However, this child was NOT anaphylactic to the dairy-based chocolate chip. What could have been a terrible situation reminded me of why I'm so passionate about allergy awareness and education. My greatest concern as a parent is not 'IF' something happens, but 'WHEN' it does, will everyone know what to do? And they did. The child alerted someone immediately and the adults responded according to policies and procedures in place. My feelings as to how the school personnel may handle one of my children having an allergic reaction is with confidence. We and our children do the best we can with their challenges. Our kids are human. They want to fit in. They want to participate like everyone else. No matter how 'on top of their game' you think they are with managing their food allergies, it's possible to get caught up in the excitement sometimes. As adults, it is important to remember the influence of peer pressure. Educating our kids is one step we can do for them. We can't put the pressure solely on our children with food allergies to take care of themselves, especially those in elementary grades. 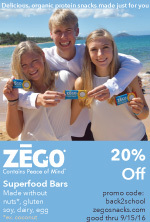 We can expand their safety net by ensuring their peers and teachers are also well educated in handling food allergies. A huge thank you goes out to the support of the Home & School Association, the Principal and the MANY families and students, those WITH and WITHOUT food allergies, who helped bake and work the tables during this event. YOU made this BAKING EXTRAVAGANZA the wonderful event that it was! I want to add an additional thank you to the local and national businesses who supported this baking event with items for our school raffle. They enabled us to make this event not only educational, but fun too!! I learned a lot from this year's event. Will I have another 'Baking Extravaganza' next year? The 'Kids With Food Allergies' have already told me they hope we do. Only time will tell. It's something for me to ponder. The greatest challenge is striking a balance between offering events for kids who can eat anything and kids who can't eat everything. The next day a mom asked me where to find the WOW Butter. I had samples available for all of the students on the tables and her kids LOVED it. She shared it with a neighbor who has two children anaphylactic to peanuts. This other mom was thrilled to find an alternative so that her children can have their own experience of a 'Peanut Butter and Jelly' style sandwich that so many others take for granted. This 'Baking Extravaganza' made a difference for at least two different families. Despite the glitches along the way, this is why I do what I do! Thanks! It really was a wonderful day! I appreciate you taking time to post. Congratulations on an EXCELLENT event and, most importantly, experience for the kids. We're so proud you included us and appreciate the opportunity. Way to go! Thanks Elizabeth! 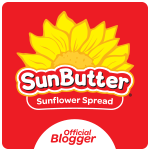 You know you're making a difference when people are asking for more Sunbutter after the event and wanting to know where they can find it locally! That's a shame that one of the kids had an allergic reaction, glad it turned out to be not too serious. I'm glad that it all went well overall. Steph... thanks for taking time to post. We were pleased with the event! A lot was learned by everyone in many ways about how all we need to be more allergy aware and educated~ Was very relieved the one kid was okay but am thankful for the learning experience.